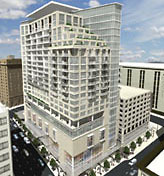 1 Hotel & Residences broke ground this past week. The $200 million project states they are more than 50% reserved on condo homes and oversubscribed on city suites (hotel / condo units). AVA Condos will begin scheduling private preview events in July for interested buyers. At 445 feet, AVA will be Seattle’s tallest residential tower. aZul Flats is offering a $7,500 buyer bonus on 2 bed / 2 bath homes for a limited time. Fini announced that interested buyers still have time to select their color scheme. The color scheme selection deadline is July 1st. CityView reduced prices on select homes and are still offering paid HOA dues for a year and a $5,000 buyer bonus. Parc is 85% sold and approaching completion. Homeowners will be able to start moving in later this Summer. Units are still available starting from the mid-$300,000s. Escala reports they passed the $50 million sales mark during the 1st month of sales. Trace reports they have sold over 60% of their homes and have released 10 additional units. The buyer’s lounge is now open in the Gun Club 4-9 PM on weeknights and 10 am – 6 pm on weekends. For additional information or questions about condo or loft projects, please contact us.